Text to speech converter software translate notepad, readable PDF eBook, Word into the human sound in normal verbal speaks. Text to Speech can change any text content such as MS Word, RSS feed, RTF, stories, Webpage, articles, news and Emails into usual spoken audio voice. User can hear this converted WAV audio with the help of any MP3 media players. 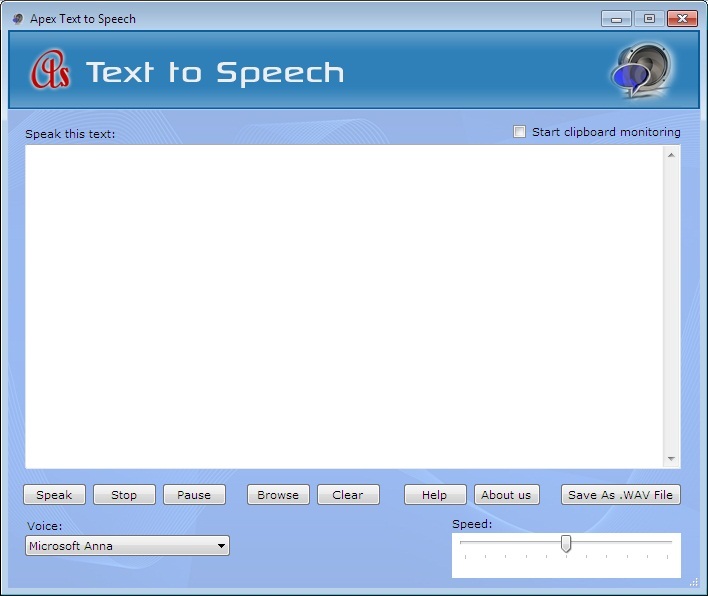 Text to Speech provides best GUI that work?s very simple and easy to use. Text to Speech is one of the best text to speak application reads clipboard text content in natural sounding voices. Word to audio utility can read your clipboard text data from any file and change it into WAV format for listening anytime and anywhere. Comprehensible human sounding voices just click save as button to create a WAVE file for hearing. Text to Speech provides best GUI work?s simple easy and fast. You can make your audio file from your notes eBooks paper and other text document with this simple program and no need to any other supporting application. * You can set the speed of output sound. * Text to Speech provides best GUI. * Text to Speech supports all text formats. * Read text from web page, Word, Outlook and other text based programs. Text to Speech Reader and Text to Voice files Converter. Read your text files aloud and batch convert them to MP3, WAV files. Listen any text file and convert text to WAV,MP3 and VOX format. TextReader lets you listen to text instead of reading on screen! ATTS is a speech utility that can read any text back to you. Read your texts in high quality voice, and convert Text to WAV after purchasing. Text 2 Speech 1.0 converts text (txt, doc, pdf, htm, rtf) into spoken audio. Qweas is providing links to Text to Speech 2.3.8.2 as a courtesy, and makes no representations regarding Text to Speech or any other applications or any information related thereto. Any questions, complaints or claims regarding this application Text to Speech 2.3.8.2 must be directed to the appropriate software vendor. You may click the publisher link of Text to Speech on the top of this page to get more details about the vendor.